First day as a Professional poker dealer is complete. I worked for a total of six hours at “The Poker Room NH” on Tuesday, January 3. Right after I checked in, I was assigned to deal at a Limit Holdem 2/4 table (2/4 means that the bets start at $2 for the first and second round of betting, pre-flop and flop, and $4 at the turn and the river). I was being shadowed (an experienced dealer was right behind me), and I was all nerves. This poker room is where I have been playing for the last year and I have a high regard for the dealers and their professional demeanor. And now I am one and I am in the hot seat. It was not as easy as I hoped it would be. It turns out that each poker table has character. I was having trouble shuffling the cards and did not know why. I have had hundreds of hours practicing at home and dealing at free poker events. It was not until a few hours later that a fellow dealer pointed out to me that some of the tables are worn in spots that makes handling and shuffling the cards very difficult. Thank you fellow dealer for that very important and helpful tip. I was having a loss of confidence until I learned about the differences between individual table tops. I was moved from the cash games to multiple tables tournaments. It was quite an experience. The big difference is that the betting amounts and chip values are different from the cash games. There is more demand on math abilities and concentration abilities. The main goal as a dealer is to keep the game moving as smoothly and quickly as possible. Whenever I did something incorrectly, the players would let me know, in a nice way, since I was a first time dealer. I have a limited amount of time to improve as they will not be as kind the next time I err. That so called Honeymoon period, you know. There is always something to learn, both from my experiences and from the suggestion of other players. Last week when I was playing in a tournament, one of the players suggested that when I was the dealer that I move my arms back to my sides as soon as I spread the flop cards (the first three cards to be displayed once the initial round of betting has concluded). She had a hard time seeing the cards until the dealer moved back. Another player suggested that I put my cards down first before pushing the pot to the winner. Sometimes the betting causes all other players to fold before dealing is completed. Normally, I place the deck down after dealing the river card, the fifth card. I appreciated all the suggestions, both from my fellow dealers and from my customers. My next day at dealing will be Friday and until then I am going to practice, practice, practice. Last year I had my worst losing year on record in online poker. My live game is a lot more profitable. I am going to stick with live brick and mortar poker until there are more weaker players online. In fact, I will try to wait until online poker is legal in the US. By that, I mean the money transfer part. My goal for 2012 is to become a professional poker dealer and then become the best dealer possible. Last year I started dealer training by purchasing an online dealer training course. The local poker room, “The Poker Room NH”, advised me to get live dealer training from “The Dealing Academy” run by Le-Ann Anderson in Haverill, MA and I did. Last week, I went to “The Poker Room NH” and filled out the initial employment paperwork. I also received instructions from one of their more expienreced dealers on how to deal for the MTT – multi-table tournaments – that they are offering on a regular basis. I am one step closer to starting my goal of being a dealer. Tomorrow, I go to “The Poker Room NH” for more orientation and hopefully a dealer assignment. 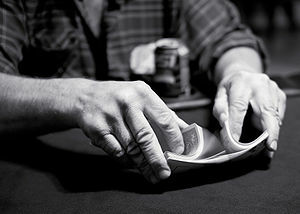 While waiting, I practice at home on the basics – the mechanics of shuffling and pitching the cards. I want to do this well enough and fast enough so that I keep the game going at a reasonable pace. The one thing I do not want to do is to interfere with the action from the players. I will control the atmosphere and the pots, but I do not want to influence the players in their decisions. To that end, my goal is to be friendly and fair and enforce all the rules in a non-biased manner.